Jungle Red Writers: True-Crime Tuesday: Goat juicing! JAN BROGAN - Probably because I grew up in very urban New Jersey, I used to love young adult novels set in rural settings, where most of the activity centered around the 4-H Club. There I was hitch-hiking to the bowling alley and hanging around parking lots with the tough gang in town, while these kids were trying to bake the blue ribbon chocolate cake, or raising a prized pig. It was all so foreign, so appealing and so innocent. Perhaps that's why I had such a strong reaction to a recent story in the Boston Globe about the grand champion goat from this year’s Colorado State Fair, who had much the same fate as former Red Sox star Manny Ramiriz. The grand champion and another goat raised by the same family were disqualified after testing positive for an unapproved feed additive. But the story gets better, because the family claims that their goat feed was tampered with. What's at stake? The college student who raised the champion won’t get the $5,500 for her State champion, and her younger brother won’t get $1,300 sale price of his goat. It also means both are barred from all future livestock events at the fair. I don't know about you, but I'm seeing all sorts of YA mystery possibilities. The jealous rival who tampered with the feed. Or maybe a jealous boyfriend who doesn't like how all this champion goating is taking his former girlfriend the away from him to college. Maybe there are helicopter parents in the wings, pushing the two kids to win at any cost. Or it could be the feed guy is trying to boost feed sales by producing a champion. You get the picture. Nearly any kind of competition can mean cheating. And cheating means tension, who know, maybe someone kills the goat? I LOVE this! And the candidates for best pumpkin or squash have been injected with food coloring.. ..I also love the image of you hitchhiking to the bowling alley! Murder at the 4-H? We could probably sell this! Where I went to school, a big club was Future Farmers of America. Maybe that's really a front for..something?? If you decide to do this you should talk to Claudia Bishop. 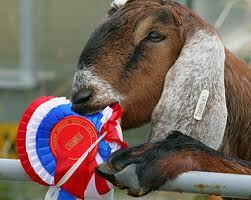 She breeds goats commercially. She'd know all about goat doping. I don't have a good goat story -- but I'm also a jersey girl that grew up going to the bowling alley Sat. mornings :) And I like the idea of the injected pumpkins! Maybe they were also fertilized with HGH! So I'm thinkin' the scandal of the contaminated goat feed points to Big Pharma and GMO grain seeds that wind up in the (innocent) farmer's organic champion stock feed. The farmer's organic certification is lost, costing his family their reputation for everything organic -- from grains, animal feed and vegetables to their children's lemonade stand. The goat owners have to sue, sez their lawyer, to prove they weren't in on a shameful act of goat juicing and to persuade State Fair officials that their kids should not be barred from future livestock events. Big Pharma sues for patent infringement when GMO seeds are found on the farmer's neighboring organic fields. The lawsuits ruin the farmer's business and his farm goes up for sale. Men in Suits show up to buy the farm -- and Big Pharma continues their evil plan to acquire the next independent farm. Somebody gets mad enough to commit murder. Trouble in River City! A competing goat contestant conspired with the Men in Suits -- will he get his karma? A State Fair judge was on the take since his nephew's on the Board of Big Pharma corporation. A rival corporation is suspected of doing the dirty GMO deed to implicate Big Pharma and drive their stock price down. The farmer's foreman loses his job and swears he'll get even. The goat owners are incensed and want revenge. And the punch line has to be, somebody got their goat. Maybe we bowled at the same alley?